Omaha Street School - An Alumni Story from Still in Motion Images on Vimeo. At OSS, students have opportunities to build and maintain healthy relationships. By participating in more positive academic and leisure activities, students are less likely to engage in risky behaviors and are more likely to thrive in all area of their lives. Community service-learning, family nights, Venture Crew, and sports are some of the opportunities in which OSS students can engage and grow personally. Service learning actively engages students in meaningful and personally relevant service activities. Students will work with their instructors to design and implement service projects throughout the Omaha community. Academic studies, life skills, numeracy and literacy skills are integrated into each service activity which introduces and enhances personal developmental assets. Research shows that students are more successful academically when positive communication exists between families and the school environment. OSS and community partners collaborate with students to plan special evenings and activities throughout the year to engage families in positive school support. Family nights include dinner and fun activities for all ages. Currently OSS operates as a Rule 14 school in the State of Nebraska. This allows us to operate as a recognized school and award a high school diploma. OSS is accredited through Advanced Ed (formerly known as CITA). As a private school, OSS is partially funded by student tuition. We want students to understand that an education has value, but at the same time, no student will be turned away due to financial hardship. A Sliding Tuition Scale is available. Prospective student and parent/legal guardian must schedule and complete an interview with the Director of Student Services who can be reached via email at [email protected] or by phone at 402-451-5234 x152. Schedule and complete academic placement testing. If student is accepted, a $50 registration fee and first full month’s tuition is due prior to student beginning classes. Even though I know Webster's dictionary couldn't produce the words needed to describe my love for the Omaha Street School, I am gonna give it my best shot. Now although I am not a graduate of the Street School, i was enrolled there for three and a half years until my father passed away and my life took a cold dark turn. In those three and a half years I obtained more knowledge than I would've ever thought possible. Not just academically. I learned about God and what it means to have a relationship with Him. I learned about myself and understood what RESPECT meant. And I learned that sharing the same blood has nothing to do with what makes a family. The reason I am writing this is to help everyone who is not familiar with the Omaha Street School understand that when you lead by example and take the time out to educate children on a spiritual and moral level as well as academics you can mold their minds. And I didn't watch that on TV or read it in a magazine, I lived it at the Omaha Street School. The staff and volunteers that keep the school functioning are 100% dedicated to making a difference in our community and helping "at risk youth" find their way in life. And reluctantly once my father passed away and I made the decision to drop out of school, the things I learned had become a distant memory. Actually it was more like non existent. I began abusing drugs and alcohol heavily until I found myself so caught up in addiction that I began committing crimes to acquire money to support my nasty habbit. And when the things I did in the dark were finally brought to the light I found myself in front of a judge. And that judge was not interested in my struggles or the trouble I endured as kid. She handed down a sentence of 3-9 years in the Nebraska state penitentiary. I was only 19 years old and I was being shackled/handcuffed and sent to prison. And of course I still hadn't even got to properly grieve my father's death. So rather than looking to God for guidance and asking him to help me see the positive in my chaotic lifestyle, I instead became resentful and bitter towards him. I blamed God for the problems of my own making. I even became angry and bitter towards my family, friends and the people who love me most. And in a short period of time my circle became small. I left the Lincoln Correctional Center in November of 2013 about as bitter as a man can get and all the resentments and anger I had built up had only made things worse. And shortly after my release I was living the same lifestyle that had got me incarcerated in 2009. Drug abuse, anger, resentments, violence, deciet and self destruction. And the devil was cheering me on the entire time. But as our Lord and savior would have it I eventually knocked on the door of the county jail until I was once again in handcuffs facing 2 more felony offenses. And or whatever reason when I put that orange jump suit on and grabbed my bed roll, God intervened. It was like he was patiently holding his hand telling me "my hand has been here since the minute u first let go of it in 2009 and it will b here until to you are ready to reach out and grasp it." So a few days later after all the drugs wore off and I had some time to think I got down on my knees (literally) and ask that God come back into my life. I asked that his will be done in my life and I asked for the power to carry out whatever that will may be. And that night God let me know that he heard every word and assured me that with him change was possible. And not once did I pray that God take me out of jail n grant me my freedom. Just that his will be done. At court one of the more serious felonies was dismissed and the other was reduced to a misdemeanor that I was sentenced to 6 months for. 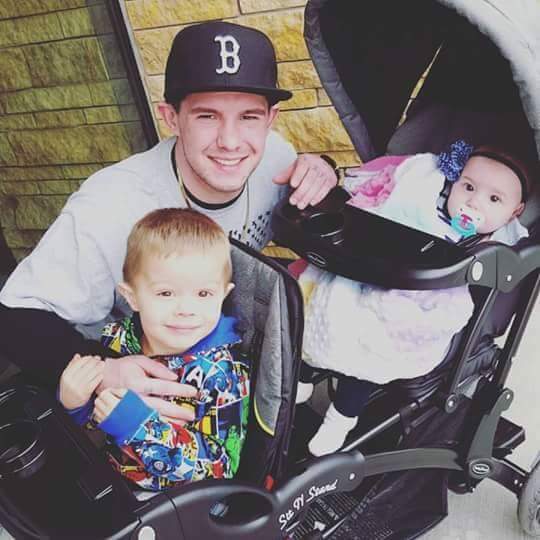 I was released from Douglas County Corrections on February 18 of this year and by the grace of God I am 5 months sober, I have two beautiful kids and a loving woman, I am currently making amends with my family and loved ones, I have acquired more in the last 2 months than I did in two and a half years after my release from the penitentiary. And it just feels so surreal to me. Now to some people they may read this and ask "why didn't he take what he learned at the Omaha Street School and apply to his life to avoid the trials, tribulations and the heart ache that he went through?" To those people my reply would reply by telling them that that the education, spiritual growth, morals, values and life skills that obtained there was not for me to avoid the things I went thru. It was obtained so that I had the strength and tools needed to survive what I went through. And most importantly the knowledge that peple like John parsons, Charles wilson, Laurie states, monte lund, and Jackie kelsey taught me was not something they spoke about in a classroom. They taught me by doing it. Again, leading by example. Making an impression on me that would last me a life time. So now that I am working on making amends and facing the wreckage of my past I can utilize the tools they gave me to continue on the righteous path. I know and believe that jesus is my Lord and savior and with him guiding me I can not go wrong. I know how to read, write and express myself in a respectable manner. I know what family means and how it feels to b a part of a small but mighty team. And last but not least I know that without the Omaha Street School, i may not have made it through the obstacles I have overcome. I am blessed to say im a survivor. Whether this post is read by 20,000 people or it is only read 2 people, I hope that it will help shed light on what the staff/volunteers are accomplishing. "Transformation through education!" I was there when we voted on the that school motto.And I'm not sure we could've decided on anything that would've defined the Omaha Street School as well as that. Because the simplicity in it all is that lives are being changed at that school and kids are gaining so much more than just an academic education. They are learning what it means to stand firm in what u believe and with the help of God there are no limits to success and happiness. To those who might stumble upon the book i just wrote, if u feel like you or another teenager you know are feeling hopeless or think you are not capable of an education, I ask that you get in touch with OSS and express ur issues and needs to them and allow yourself to transform into a new and improved you through the education that OSS is willing to provide.